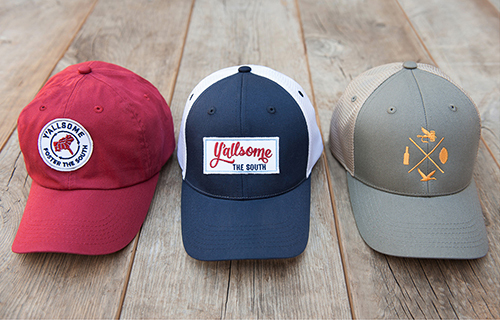 Soon to be Nashville based, husband and wife duo, Megan and Craig Evans started Y'allsome to produce goods that represent the Southern experience with designs that are simple, fun and clever. The tees are so soft because they source their cotton from Ronnie Burleson, a 3rd generation cotton farmer in Richfield, North Carolina. Megan was gracious enough to send me the Sweet T tee and as soon as I tried it on, I kept it on. I loved it and I loved Y'allsome even more as I researched their company and efforts to create a brand totally unique to the South. As Megan shared, "We wanted to create a product that was completely made from scratch in the South to support Southern business. Besides making an incredibly soft, heavy-duty shirt that oozes quality, the benefit is that it supports local industry and in doing so, the environment, as the shirts don't have to travel far to be printed." Georgia based artist, Ginny Givens stitches custom embroidery on every hat sold at Y'allsome. Just another southern local sharing their skills and love of the South. Check out all the Y'allsome goods, which includes their incredibly inspiring work for foster kids, here.